With free puppy training tips, you can start training your pup as soon as you bring her home. It will take awhile as puppies have short attention spans, but it will pay off to start training young. You'll have a well behaved and personable dog as she grows older. As soon as you get home with your pup, take him outside to where you want him to potty. Do it before he goes into your house. Wait a few minutes, when he goes potty, praise him abundantly. This lets him know right away that he did a good thing. It will take more training to reinforce this, but you're off to a good start with house training a puppy. Remember that poodles are highly intelligent and love to learn. Encourage learning by teaching her potty skills, fun training games and commands for sitting, staying and lying down. Teaching her helps her learn words, body language and communicate with you. It also helps her learn what behaviors are and are not acceptable. Basic obedience training is good for puppies under 6 months of age. Be consistent! Your poodle is intelligent, and you can't be okay with something one time and unhappy the next. It will confuse him and cause distrust. 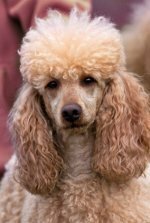 Ask your breeder or friends with poodles what problems they had with their pups. Ask them how they corrected it. This will help you train your own dog. You can also seek out courses and ebooks to help you. Common problems include nipping, jumping and crying, puppy barking and chewing, and getting your dog to come to you when called. Ask dog owner friends, your vet or breeder about dog training classes in your area. You can also watch videos online for free puppy training tips and read training books. You'll learn how to train which prepares you to actually train. Training tools include dog litter boxes and paper training. You also need patience, compassion, love and gentleness when training. 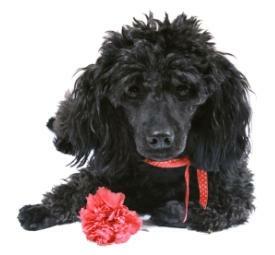 Your poodle needs a collar, dog tags and a leash for leash training puppy. Holly refused to go on the leash as a puppy and never would tolerate a leash, but we don't recommend this. Train your pooch early on to tolerate a leash, and he'll learn that is the only way he will get walked. 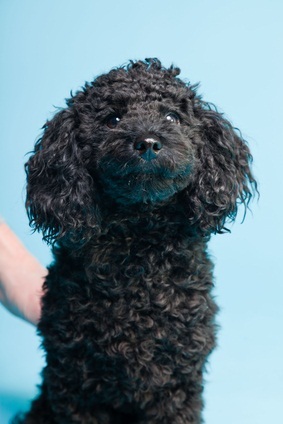 Start by teaching your poodle words he will need to know - his name, potty (or whatever you call it), food (eat), bed (sleep), sit, stay, come, lay down, shake, roll over and any other words he can combine with actions or activities. Teach her why she should do something as well as how to do it. Once your pet learns something, move on to something else. Don't forget a dog training treat! Poodles will remember what they learned and will get bored if you keep repeating the same things over and over, especially once they've mastered something. For those pooches who learn quickly, try dog agility events and training for them. Poodles also make good therapy dogs. Free puppy training tips: keep training consistent, and try to do it at the same time each day. 15 minutes is sufficient time. Have goals set for each training session; expecting too much in one session will lead to frustration for you and your dog. Training a pet takes time and commitment. Puppies want to learn, and want their owners to be happy. 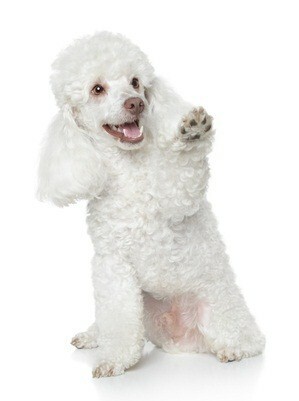 Poodles are intelligent enough to catch on when their owners are happy and will want that owner happiness to continue.